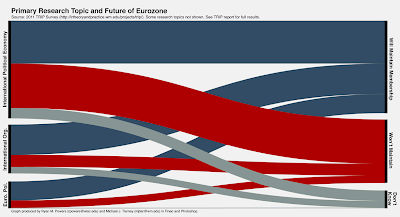 It may not be easy to see (click here for a bigger image, and here for some discussion at TMC), but the above graph shows the probability that a political scientist will think that the eurozone will split up versus stay together. The group in the top left are IPE scholars, the middle are International Org scholars, and the bottom are comparativists who study Europe. 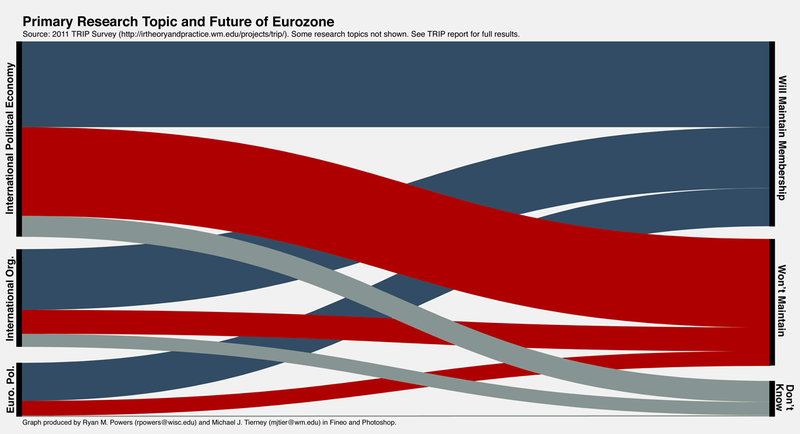 I'm not a big fan of this graphing style, as it seems to obscure nearly as much information as it illuminates, but it's fairly easy to see that IPE folks are the most convinced that at least one country will leave the euro. More than half of us. Meanwhile, only about 37% of IO folks and 30% of Europeanists think a country will exit the common currency. I find this interesting for a lot of reasons, but mostly because I think provides a pretty stark reminder that political scientists think very differently about politics. This could break down along paradigmatic lines -- the authors of the report note that constructivists tend to be comparativists, while realists tend to be in IR. I still think that a materialist conception of politics carries me farthest down the road I wish to be on, so I think it is fairly likely that a country will drop the euro if things continue to deteriorate. I've had many conversations with Europeanists on this point. All of them are enamored of the EU. For them the collapse of the EU is unthinkable. I can't understand why. It's not as if fixed exchange rate regimes -- and political unions -- haven't collapsed before, particularly when subjected to this level of stress. That said, they certainly know more about Europe and the European identity than I do, and they take it very seriously. I don't really have an answer here. I hope that conditions in the EU improve enough that we don't have to test these paradigms this time. A confederal Europe is good for the world, on net, particularly if they can figure out how to manage the broader economy in ways that don't lead to periodic crises. But I have my doubts about that.